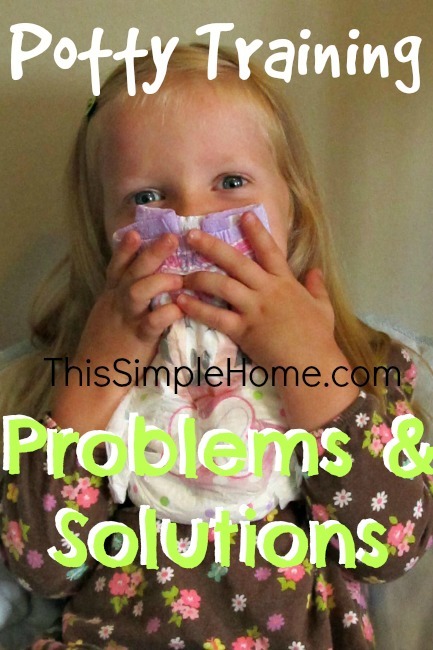 Long ago in the month of May, I shared with you readers' potty training tips. The day the post went live was the same day I stopped potty training. You see, my little girl, who is will be three this month, used a powerful word when we were potty training. No. The second time she said it, I knew we were done. Little Sister playing peek-a-book behind a Pull-Up. We put potty training on hold. Though I had thought she was more than ready, it wasn't worth the fight. While planning for vacation at family camp and the in-laws' during the summer, I knew it wasn't the right time for potty training Little Sister so we waited even longer. Once Big Sister and Brother were in school, it was time to try again. Please note, though I was provided Pull-Ups for this post, I actually had two packages of Brother's Pull-Ups from three years ago that had not expired. Pull-Ups are great to assist with potty training. Little Sister has been potty training happily for a month now. She's doing great. Here's how. Little Sister naps (or is supposed to) daily. Before she falls asleep during the day, she often needs to go to the bathroom one more time. Pull-Ups make this process a lot easier so she can do much (sometimes all) of it herself. If a child needs to go often during the night, Pull-Ups are easier to maneuver than diapers. We're busy. When we're out for any length of time, she wears Pull-Ups. Can I tell you that she wore underwear twice when we were out for a really short time? I was feeling so brave. I must admit, I was also careless that first time...we didn't have spare clothes in the van. Obviously, Pull-Ups are as big part of our potty training process as underwear. The learning designs help me to know when Little Sister is just a bit sweaty...or actually wet. Little Sister enjoys looking at the characters on the Pull-Ups. Her favorite is Minnie Mouse. Some others included in the package that was sent to us are the Areil from The Little Mermaid and James P. Sullivan from Monsters, Inc.
Pull-Ups want to assist parents with potty training. I had fun creating the little news video announcing Little Sister's first flush. In addition to the Pull-Ups informative website, also check them out on Pinterest, Twitter, Facebook, or use #PullUpsAcademy to find more about them. Many parents also find the Time to Potty App beneficial and the children find it fun. Would you ever stop potty training once you started? I will definitely have to give pull ups a try. I am going to be potty training my daughter this year. She is our first child, so I have never done this before. I'm just so glad I'm done with potty training! My eldest was the most difficult, but it was certainly not something I loved doing. :) Good luck! I am so happy I don't have little ones, but both of my kiddos took to potty training fast.